Social media can be tricky. If you do a million things well, they may go unnoticed. But if you make just one bad mistake -- just one -- you can be the source of criticism for months, and maybe even years, to come. You'll probably even have quite a bit of crisis communication and damage control on your hands. 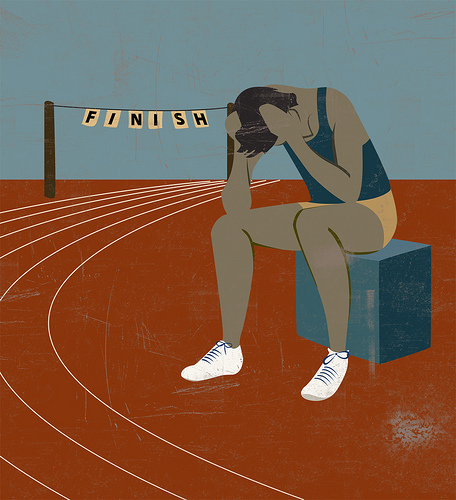 Want to learn what to avoid before your company repeats history? Keep reading about these 7 social media sob stories and how to prevent the same things from happening to you. Netflix got a lot of heat after it decided to launch Qwikster, whose purpose was to separate Netflix's DVD-by-mail service from its online streaming service. 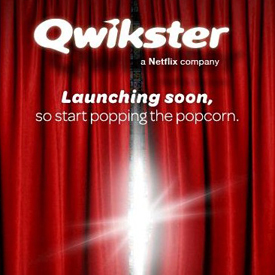 While launching Qwikster would've been a big mistake in itself because users who wanted both DVDs by mail and online streaming would've had to create a separate account for each of the two services, Netflix's social media strategy was completely off as well. When users tried to follow @Qwikster on Twitter, they found a user who talked about drugs and cursed a lot. Even though he wasn't associated with Netflix, a bad name and poor judgment became associated with the Netflix brand as a result. There are tons of examples of companies that have chosen other Twitter usernames that weren't necessarily their exact company name to avoid a situation like this. For example, Chipotle uses @ChipotleTweets instead of @Chipotle to make sure people know it's the official account for the company. Just be sure to promote your official social media accounts at the launch of your company so it's clear which account belongs to you. Additionally, it's tricky, but if you are able to get Twitter to verify your account, it is helpful to show the public who is officially tweeting on behalf of the company. @KennethCole used the uprising in Cairo to promote its spring collection, as shown in the tweet below. People were appalled that Kenneth Cole himself would use such poor judgment and leverage a sensitive situation as a promotional tool. The disaster in Egypt was a serious matter, and it shouldn't have been joked about by a brand. It may seem cliché, but you need to think before you tweet. Don't use a disastrous situation as an angle to promote your products. Don't use someone's death as a way to promote your products. Your ground rule should be not to use anything that could potentially be hurtful to people to promote your product. Following the examples of many other companies that provide customer service on Twitter, CVS launched the Twitter account, @CVS_Cares. The purpose of social media is to be transparent and connect with people, even if they are not necessarily your followers yet. But when CVS launched its new Twitter account, its tweets were protected, meaning only that only people who CVS approved could follow their tweets, and its tweets weren't made publicly available. In other words, CVS had to approve everyone who wanted to follow them. All of your social media accounts should be available and accessible for the public. Never make your tweets private, disable comments on your Facebook wall, or limit engagement in any other way in social media. Not only does something like protected tweets add more work for your company since you'll have to accept all requests from users who want to see your tweets, but it will also frustrate people who are unable to see your content until you are both connected. Furthermore, it will prevent your account from gaining any sort of traction, and it will also prevent you from generating the reach you want to build in social media. One of the main purposes of having a presence in social media is to be accessible to your audience, and being private takes that accessibility away. So who's doing it right? Comcast was one of the first companies to offer customer service on Twitter with its @ComcastCares account. The purpose of this account is to handle complaints and support requests from Comcast customers. Bill Gerth, the manager of the account, spends his time responding to various requests. He remains completely transparent and epitomizes what people are looking for in social media. Now, Comcast has a whole slew of Twitter accounts owned by various Comcast support reps to handle the volume of support tweets it receives. While we are on the subject of ghastly Twitter mistakes, let's take a look at something a popular fast food restaurant did recently. McDonald's launched #McDStories as a way to share fun stories about people's experience at McDonald's. What McDonald's didn't foresee was people sharing negative stories about the McDonald's brand, and that's exactly what happened. Anyone who searched for "McDStories" immediately saw thousands of tweets similar to the one below, which described awful experiences users had with McDonald's. Before choosing a hashtag that will frame your campaign, check to see what (if anything) people are already using that hashtag for. Also think about the other ways people could possibly interpret the hashtag. A fast food chain, especially one that has experienced controversy and negativity toward its brand in the past, should understand that it will have quite a few naysayers willing to speak out against their brand. Offering them an easy way to voice their discontent is never a good idea. Instead, McDonald's could've used other methods it had more control over for distributing positive stories about its brand such as publishing positive testimonials and customer stories on its website instead of using a free-for-all public platform. ModCloth on the other hand, is an example of a brand using hashtags the right way. The clothing retailer started a Twitter contest for Valentine's Day and asked followers to use the hashtag #sweetsongs to turn their favorite songs into a candy-related song. The contest was well received and elicited many tweets throughout the day. It also remained on-brand, as ModCloth uses short, cute phrases similar to the ones being tweeted to describe its merchandise. @HabitatUK wanted to get more followers, so it decided to take advantage of trending topics. However, instead of relating its tweets to some of the more popular trending topics, it hijacked popular hashtags such as #Apple and #iPhone in order to show up in people's Twitter searches. 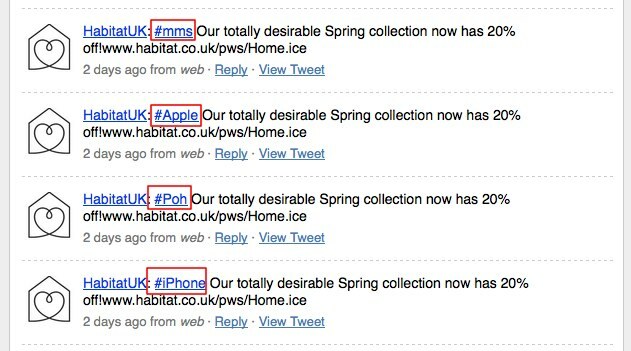 Habitat's tweets had nothing to do with Apple or the iPhone, but its tweets still showed up in searches for these hashtags. It's a great idea to include trending topics in your tweets, but only if the content of your tweets are relevant. As @HabitatUK learned, its brand was hurt when people started calling them out for their spammy behavior. Since then, the company has learned to only use trending topics when they're applicable to their tweets. Fast Company, on the other hand, is great at utilizing proper hashtags on Twitter. In the example below, Fast Company uses hashtag #infographics when its tweets about an infographic. The rule of thumb should be, if you're providing more people with valuable content by using a hashtag, then use it. In this case, people who are interested in great infographics can learn more about them through this tweet. 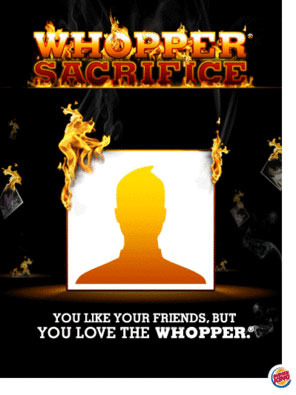 Burger King started a Facebook contest called the "Whopper Sacrifice." If a user de-friended 10 of their Facebook friends, they would get a coupon for a free Whopper. This caused a lot of dismay and confusion because Facebook is about connecting with your friends, and this campaign encouraged people to connect with fewer people. It also violated Facebook users' expectation of privacy, causing Facebook to shut down the campaign. Looking for an example of an effective Facebook campaign? 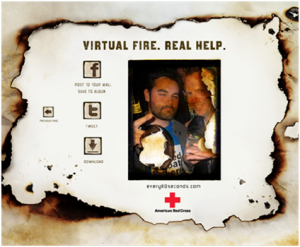 The American Red Cross of Greater Chicago launched a virtual campaign called 80 Seconds, in which users would connect their Facebook accounts to the campaign and watch as photos they had uploaded to Facebook were virtually burned. The campaign went viral because it effectively showed people the dangers of house fires in a powerful, yet social way. One of public relations/marketing agency Ketchum's biggest clients is none other than shipping giant FedEx, which is based in Memphis, Tennessee. So the morning before a client meeting with FedEx, when one of the Ketchum's vice presidents tweeted about how he would die if he had to live in Memphis, needless today, FedEx was infuriated. When you post updates in social media, you need to remember all of the stakeholders that are important to your company. That may include customers/clients, partners, investors, or the press. Don't be stupid. Be careful not to publicly tweet or share anything offensive or something that could be taken the wrong way. You may not be tweeting/sharing from your business' corporate account, but you will still be held responsible for your company's reputation. 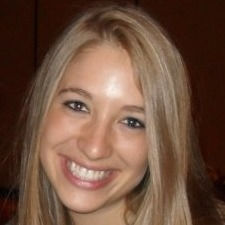 What other rookie social media mistakes have you seen business make?